The least-expensive Echo does everything its pricier siblings do, but you should add an outboard speaker to play music on one. When I reviewed the Amazon Echo 13 months ago, I predicted that people would want one in every room. The Echo can control your home’s lighting, play music, estimate your commute time, operate a timer, answer trivia questions, read books and news bulletins to you, tell you which movies are at your local theater, and so much more. You can order a pizza from Dominoes, a ride from Uber, or virtually anything from Amazon. You’d want one in every room so you didn’t need to walk to the room it was in to use it, or yell “Alexa!” from across the house to get its attention. I’m sure Amazon loved my idea, but it was never going to happen on a broad scale at $180 a pop. So Amazon got wise and iterated on the concept, introducing the battery-powered Echo Tap and the puck-sized Echo Dot in March 2016. But the Dot still cost $90, and the $130 Tap lacked the voice activation that made the Echo so useful. It was easy to take the Tap from room to room, but needing to push a button to get Alexa’s attention spoiled the magic. The second-generation Echo Dot reviewed here is the best of them all—even if you buy only one. Amazon removed the original Echo’s large speaker and volume-control dial, replaced them with a chintzy speaker and a pair of buttons, and sliced the price to $50. It costs even less if you order six at once (you get one free, bringing the per-unit cost to about $42). So for $250—40 percent more than the cost of a single Echo-—you can put Alexa in just about every room. That’s exactly what I’ve done. The Echo Dot is like the original Echo with most of its bottom sliced off. The Dot has the same far-field voice recognition technology, supported by seven microphones on top (six in a circle, one in the center), as the original Echo. If more than one Dot hears you say the Alexa wake word, they’ll all wake up, but only the one closest to you will respond. That prevents simple problems, such as having a cacophony of Alexas all talking at once, as well as bigger ones, like ordering one pizza and getting six delivered. One shortcoming I’ve discovered with the Echos’ mics—I’ve tested the original and the Dot—is that they have difficulty hearing you when the TV is loud or when loud music is playing (on either the Echo itself or from other speakers in the room). When Editor-in-Chief Jon Philips compared the original Echo’s microphone performance to that of the new Google Home, he found that Google’s product was much better at filtering out ambient noise. He also reported that Google Home’s microphones delivered much better range. 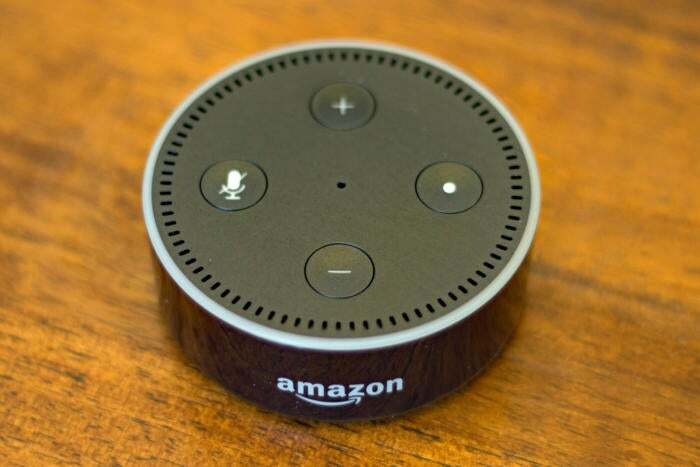 Deploying Echo Dots fixes the second problem, but it won’t address the first. I handle the problem by either pausing the TV or the music, or just getting closer to the Echo I want to use. Neither is a terrible inconvenience. You can stream music to any Echo from services such as Spotify, but we recommend connecting an external speaker to an Echo Dot. So the Echo Dot can do anything its more-expensive siblings can do for much less money. But there’s one thing you won’t want it to do: play music—at least not on its own low-end speaker. It’s just fine for playing Alexa’s voice or even listening to weather forecasts or news bulletins, but it doesn’t have the dynamic range to reproduce music with any kind of fidelity. There’s an easy fix for that: Pair it with a self-amplified speaker or an A/V receiver using either a cable or Bluetooth. 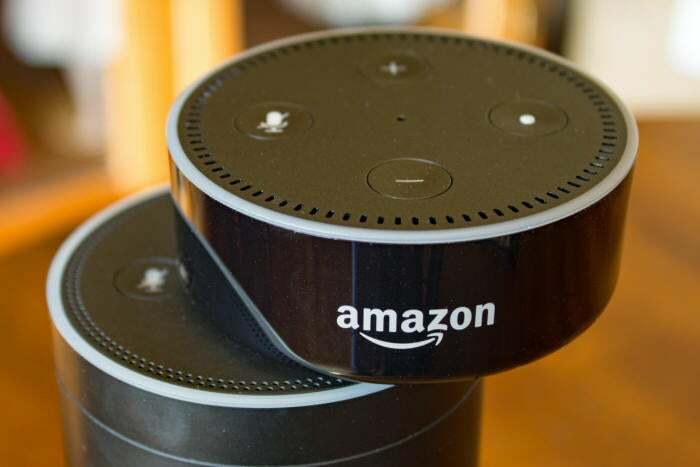 A home full of Echo Dots is no substitute for a genuine multi-room audio system, however, because you can’t play the same music in sync on multiple Echos of any type. Each one plays music independently. 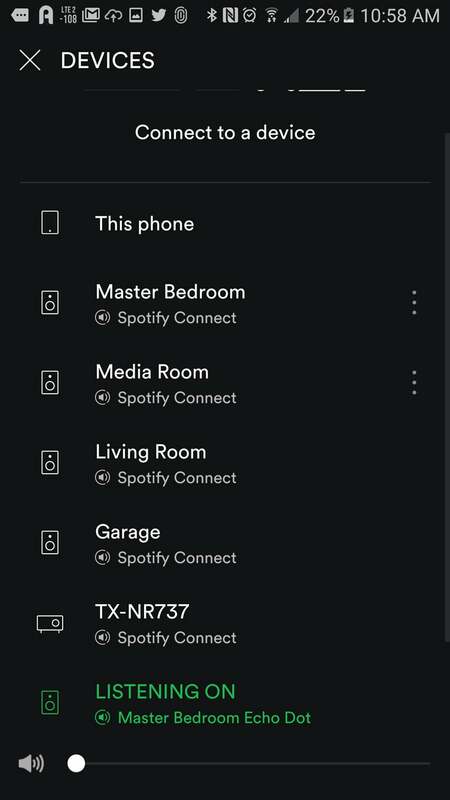 And while you can connect your Spotify Premium account to Amazon and play music on an Echo, Spotify will only stream music to one device at a time. That’s a restriction imposed by Spotify. With more sophisticated speaker systems—Sonos is a good example—you can group speakers together to play the same music. You can’t do that with any of Amazon’s Echos. Certain other applications are synchronized. You can verbally add appointments to your calendar and items to your shopping list and to-do lists on any of your Echos, and they’ll all be combined on one list. You’ll see the aggregate results in the Alexa app on your phone. Multiple adults can have discrete shopping and to-do lists, but each person must have their own Amazon profile. Adult members of your household can create their own profiles and maintain their own calendars and lists, but each person will need to have their own Amazon account. This is one of the reasons that children can’t have profiles—they can’t have Amazon accounts. I imagine there’s a legal thicket of other reasons for Amazon’s policy to not allow children to have profiles. Meanwhile, managing multiple profiles for adults sounds like it would be a pain in the neck, because you’d need to ask Alexa which profile is active each time you want to manage your lists, use a connected service like Spotify, or order something. Amazon has been aggressively building an expansive Echo ecosystem by encouraging third parties to develop “skills” that enable the Echo family to work with their products. Amazon doesn’t make thermostats, for example, but any of the Echos can control Nest, Ecobee, Honeywell, and other brands of smart thermostats. Amazon doesn’t make smart lighting products, but any of the Echos can control Philips Hue, Lutron Caseta Wireless, and other brands of smart lighting. I’ve linked the Echo to my Logitech Harmony Elite universal remote control and can control all the gear in my entertainment system. Install a smart-home hub—either a DIY solution (Samsung SmartThings, Wink, Iris by Lowe’s, and others) or a professionally installed one (Vivint, Alarm.com, etc. )—and the number of products you can control with your voice expands to include pretty much every category of smart-home product you can think of, from door locks, to irrigation systems, to garage-door openers, and more. I built my own smart home about 10 years ago and had the contractor install Z-Wave lighting controls and smart plugs throughout, including in the garage. The devices cost more than twice as much as their dumb counterparts at the time, but it wasn’t a huge expense in the grand scheme of things and it didn’t cost any more to have them installed; they were no different to the electricians. I replaced most of these with Leviton products a few years later, after a new and better generation of Z-Wave chips came to market. Today, I have 32 smart dimmers and switches, 11 smart AC receptacles, three smart ceiling fan controllers, three smart entry locks, a smart thermostat, and a smart garage door opener. 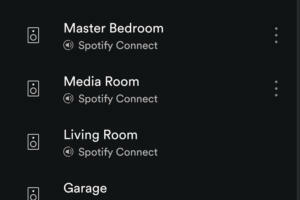 These are all tied into my Vivint smart-home system, and I can control each of them—or predefined groups of them—with a voice command from my kitchen, master bedroom, great room, home theater, enclosed patio, and yes, even the garage. 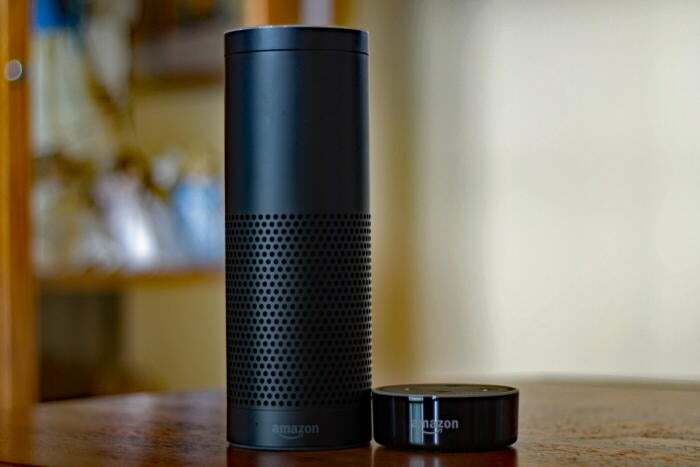 The Echo Dot is a fraction of the height of the original Echo, so it’s much less likely to get tipped over. Actually, putting an Echo Dot in the garage solved a big problem for me. The architect I hired goofed when he laid out my home’s electrical plans: He neglected to put a switch to control the interior garage light next to the door leading to my front porch. I’ve had to stumble through the garage in the dark ever since we moved in to reach the door going into the laundry room, where there is a switch). Now that I have an Echo Dot in the garage, I can just ask Alexa to turn on the light (she can close the garage door for me, too, via my Vivint system). Spending $50 for an Echo Dot was a lot cheaper than hiring an electrician to change the wiring in the garage. Wisely, Alexa can’t unlock any of my smart locks or open the garage door, or disarm my security system. I wouldn’t want a burglar to yell “Alexa, unlock the front door,” gain entry to my house, and then tell her to disarm my security system. I predict that Google Home will be the better digital assistant for the smart home—eventually. Google has better speech recognition and a stronger AI effort. And you can ask contextual follow-up questions without having to say “Okay Google” again. But Amazon has a tremendous lead when it comes to linking third-party products to the Echo series; Google won’t even have third-party developer tools for its Google Assistant until December. Viewed another way, Amazon has a less than 18-month lead on Google, but I can’t imagine that Amazon will simply stand still and wait for the competition to catch up. Let’s not forget how inexpensive the Echo Dot is, whether you deploy one or many. One Echo Dot is plenty useful on its own, but you’ll want one in several rooms—especially if you have a lot of smart devices that you want to control. It’s a great product and a solid value.